When I was a little girl, my parents used to buy us season tickets to whatever events were on offer at Ohio University’s Memorial Auditorium; we went to see orchestras, musicals, plays, and many performances that were some combination of two or more of these things. When I was older, I branched out into talks and book readings. However, concerts have always been my favorite cultural outings. Since my first pop concert (Yanni, if you can believe it), I have seen virtual unknowns and iconic veterans and everyone in between (including Emmylou Harris, Chris Isaak, Kathleen Edwards, Rufus Wainwright, and Neko Case, just to name a few). Down here in Cornwall, though, it is not always easy to attend these sorts of shows and performances. We are really, really far away from pretty much everything; getting here can be logistically tricky, time-consuming, and expensive. As a result, Falmouth folks generally need to hit the road if they want to get some culture. Prior to this summer, Sasha and I hadn’t made too many trips for this purpose; mainly we just went to gardens and beaches and other outdoorsy, nature-related destinations. This past spring, though, I began to feel an urge to diversify. I kept my eyes open for cultural opportunities, and, over the course of just a few months, managed to make up for quite a lot of lost time. Our first adventure took us to the Eden Project, which hosts a number of summertime musical acts in a series called The Eden Sessions. At the last minute, Sasha and I found out about a concert by Sigur Ros, an Icelandic band that sings in a made-up language. Their music is very atmospheric, and I can’t imagine listening to it in a better venue than Eden; it’s the type of sound that needs to be released out into the open air, rather than contained inside the walls of a coliseum. The band accompanied their acoustic performance with a dramatic light show. Sasha and I weren’t too far away from the stage, but we were off to one side and couldn’t see the performers very well. Being able to see all the lights more than made up for this; it was kind of like watching a man-made version of the aurora borealis. I wasn’t feeling too well on the evening of the concert–I’d had a headache all day and my sore back was making the picnic-style seating very uncomfortable. Despite this, I really enjoyed myself. The band gave an amazing performance and the overall show was fantastic. I think it’s probably one of the best concerts I’ve ever been to see. The Sigur Ros show was followed by another musical act that was much farther from home, and was facilitated by something I heard on the radio when I was visiting my parents in the US over the summer. While listening to National Public Radio, I heard a profile of Daughn Gibson, an artist who had previously made a living as a trucker and a clerk at an adult store, among other things. His music was as gritty and unusual as you might expect; the clips played on NPR sounded odd but intriguing. I purchased the album after returning to the UK and immediately fell in love. When I visited Gibson’s website in the hopes of tracking down some song lyrics, I discovered that he would be playing at Bristol’s The Exchange–with tickets going for a mere £7.50 a head. Sold! Sasha and I drove up after work on the evening of the concert, with the intention of checking into our hotel, eating dinner at one of the restaurants picked out of my Good Food Guide, and then heading to the show in time to skip the opening act but see Gibson’s performance. Unfortunately, the universe had other plans. We ran into absolutely terrible traffic that turned a 3-hour trip into a 5-hour nightmare; we had to cancel our dinner reservations and eat a quick and mediocre meal in the hotel. However, because our accommodations were so close to the venue, we got to The Exchange in time to see both acts. This actually turned out to be a good thing; the (local) warm-up band was extremely talented, and the lead singer had a particularly incredible voice. I wasn’t keeping a close eye on my watch, but I’m pretty sure that their set lasted about as long as Gibson’s, which was surprisingly short. I believe it was the first show of his tour, and that he’d come to the venue straight from the airport. I was a little disappointed that the show didn’t last longer, and that the sound wasn’t better (it was hard to hear his voice over the music, and to discern his lyrics). However, he did play one of my favorite songs from his new album, and I did pay less than £8 for the ticket, so I suppose I got my money’s worth. To make the whole Bristol trip worthwhile, Sasha and I went to the mall the next day to buy a bunch of domestic things that are hard to find here in Cornwall. On our drive back home, we listened to Daughn Gibson’s entire album; that helped me feel as though I’d adequately shared the music with Sasha, who had not heard any of Gibson’s tunes prior to our trip. The next outing was one that I had to make alone, since it occurred right in the middle of the work week. I was freelancing at the time, which meant that I had no scheduling constraints that couldn’t be overcome; the same was not true of Sasha or any of my friends. But, as an only child used to entertaining myself, I was more than happy to go it alone–especially since the event in question was not one that I expected any of my acquaintances to particularly enjoy. I had unexpectedly won a pair of tickets to go see the electric violinist Lindsey Stirling, who made a name for herself by converting her appearance on America’s Got Talent into a full-time career, thanks to her incredibly popular YouTube channel. I have been a huge fan of electric violin ever since I bought a Vanessa Mae album back when I was in high school. I stumbled across Stirling’s music purely by accident, but was immediately hooked. She’s got an enthusiastic and bubbling personality, and transfers all of that energy into her performances; not only is she playing music that she herself arranged, she is also doing it while dancing steps that she choreographed. Her performance was incredibly high-energy and fun, and I never could quite get over the fact that I was being treated to the show for free. The Jimmy Carr show was up first, and it was in the same format as some of his previous shows that I’ve seen broadcast on TV–but, happily, this one had all-new material. As you might expect, there were quite a few hecklers in the audience, but Carr was very adept at dealing with them. A couple provided remarks that turned into some of the funniest jokes of the evening; however, there were also a couple of truly cringeworthy moments courtesy of people who were trying to make Carr mess up, but only ended up embarrassing themselves. In any case, I laughed so much that my face hurt by the time we left, so I considered the show a success. Our second stand-up show was one that was hosted by HfC, but actually took place at the Princess Pavillion right here in Falmouth. I found out about the performance when I visited PP for the Falmouth Tea Festival, which turned out to not really be a festival or feature much tea…but at least I saw a poster advertising the upcoming show of Steve Hughes, an Australian comedian that I’d previously watched on Michael McIntyre’s Comedy Roadshow. Our final comedy gig of the season was Alan Davies’ Life is Pain show at the HfC. Sasha felt some trepidation over this performance, because we’d never actually seen Davies do stand-up and weren’t sure if he would be as funny in a lone act as he is in a group on TV. However, I think this might actually have been my favorite of the three gigs we went to see. Davies’ humor is not nearly as biting as Carr’s or Hughes’; he is almost sheepishly self-deprecating and relaxed, which creates the feeling that he’s just an old friend goofing around on stage. Alan Davies in action. I’d been afraid to take a cell phone shot until he paused mid-show and posed for some students photographing him in the front row. The poor guy had traveled all the way to Cornwall from Northumberland, and, assuming he was telling the truth, had only arrived at the HfC minutes before he was due to go on stage. He was quite good at engaging the audience in a conversational sort of way, which created an entirely different atmosphere than the one during the Carr show, in particular. Although Davies had ‘hecklers’, they were all strangely friendly, and many of them were genuinely witty and funny. I think this probably stems from the identity of the audience as much as it does the comedian–I’m guessing Davies’ fans are generally a bit calmer and more mature than Carr’s. To round out my cultural experiences this year, I also went to see a play–the first play I’ve attended since watching Much Ado About Nothing with my mom during the last summer I lived in Williamsburg, VA (home of the Virginia Shakespeare Festival). This play was another ladies’ night; I went with my friend Sarah, who, like me, is a huge fan of Jane Austen. I knew that she would be the perfect date for the play adaptation of Austen’s Mansfield Park. Funnily enough, neither of us ranks Mansfield Park as one of Austen’s best books, but we both wanted to give the show a chance regardless. One of our big quibbles is with the main character, Fanny, who has a tendency towards wimpiness and is maybe too much of a goody-too-shoes (by today’s standards, at least). However, in this particular rendering of the story, both the script and the actress did a good job of toeing the line, allowing Fanny to be pure and morally upright without being too much of a prude, or being pushed around too much by her insensitive family. I was also really impressed with how few cast members were required for the entire show. Several people played two roles, and one played three–and I did not even realize the full extent of the redundancy until the very end, when everyone came out to bow. The cleverness and efficiency of the casting were upstaged (pun intended!) only by the amazing set. Entrances/exits and clothing changes were assisted by the ‘maid’ and ‘butler’ who stood on hand to provide the bonnets, ribbons, baskets, etc. that were used to indicate where people were, what they were doing, and when each scene was occurring relative to the last one. It was one of the simplest but most effective sets I’ve ever seen, and I applaud (another pun intended!) whoever designed it. For the future, though, I plan to sign us up as ‘Friends’ of the Hall for Cornwall–a designation that will allow us sneak peaks at scheduled shows, as well as access to better seating. I am looking forward to seeing what kinds of performances the new year will bring–both in Cornwall and beyond! When you’re a kid, you can be pretty certain that you will have a good summer. From mid-June until late August, you don’t have to worry about anything except choosing ice cream flavors and deciding how you will amuse yourself for the afternoon. It is amazing–relaxing, enriching, entertaining, and, most of all, fun. Then you grow up and summers are like the other three seasons of the year, but with better weather outside your office window. If I had to make you a list of the top ten things that depress me about being an adult, having to work summers would definitely be high on my list. However, I am currently “between contracts” (to be extremely euphemistic), which has given me an opportunity to have a bit of freedom this summer. For the past couple of weeks, I have been able to do whatever I want, whenever I want to do it. It’s fantastic. I’ve watched DVDs, I’ve cooked elaborate meals, I’ve gone on ridiculously long walks along the coast, I’ve tried my hand at making a video, and, perhaps most enjoyable of all, I’ve taken up a new instrument. Of course you know where this is going. With all this spare time (and energy! ), my desire to make music resurfaced, but I had no instrument to hand…well, almost no instrument. 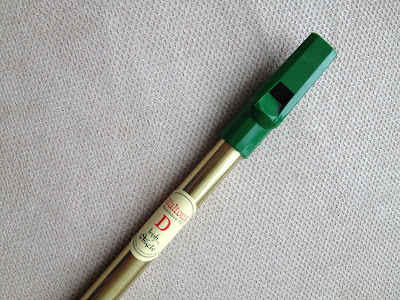 On a shelf in our spare bedroom, tucked away in its original packaging, was a Walton’s tin whistle that my mom bought me at least a decade ago when she and my dad were in Boston. I tooted on it a couple of times after I first received it, but have otherwise left it alone all this time; I had a guitar to play, after all, plus I knew nothing about woodwinds and had no real reason to make the time to learn. The whistle came with an incredibly brief instruction booklet and notations for a few songs. Many of them were Irish folk tunes that I didn’t recognize, though I was able to attempt some of the traditional American songs that were included. Within a half hour or so, I could haltingly get through an entire song, but there was nothing magical happening. So I decided to get some help from the Internet. My first whistle tune. Now that I have a bit of knowledge about the whistle, I’m a bit baffled by this notation. It’s written in the key of F, but the Walton’s whistle is in the key of D. Further, if you cover all the holes, as in the first note, you get a D, not a C (as shown here). Hmm. Although you could jump in feet first and learn by copying, you can also get some actual instruction in order to learn the logic of the instrument–which is exactly what I wanted. Lucky for me, there is a fantastic website called the Online Academy of Irish Music, and I cannot recommend it highly enough. They have tons of videos for virtually every Celtic instrument you can imagine; for the whistle, they offer introductory, intermediate, and advanced lessons that not only teach you specific songs, but also scales, exercises, and techniques. Over the course of my first evening, I went from knowing absolutely nothing to familiarizing myself with all the notes on the whistle, memorizing a new song, and learning an exercise to improve my fingerwork. I have since picked up an additional three songs from OAIM, plus another couple from other YouTube videos. This is remarkable because memorization has never been my strong suit; I have always felt very naked without sheet music in front of me. I try not to move on to a new song until I feel confident about the last one, which is why my repertoire is pretty small even though I’ve been playing for several weeks. Now that I’m fairly comfortable with the basic tunes, I’m beginning to learn some of the embellishments that characterize the best performances, and also to play songs at speed (Irish music can be very fast!). My whistles: my original Walton’s, a Feadóg, and a Clarke. Because whistles become waterlogged after a while, and also because each whistle has its own unique sound, I have purchased a couple others to keep my Walton’s company. My first addition was a pink Feadóg, partly because I couldn’t resist the ludicrous color, and partly because Feadógs are pretty highly regarded as far as inexpensive pennywhistles go (feadóg, incidentally, actually means “whistle” in Gaelic). Unfortunately, I think mine has a bit of a flaw, because it does not produce a good clear sound even on the easiest of notes. That is a shame because it responds really well to fingerwork and does a fantastic slide. My favorite whistle is my Clarke, which has a wooden mouthpiece. Some beginners complain about the Clarke because you have to learn a whole new “mouth posture” (if there is such a thing) in order to play it. It is totally worth the effort, though, because the whistle produces such sweet notes; the wood also gives the music a gentler, more haunting aspect. The whistles are a terrible temptation throughout the day. Even though I’m technically unemployed right now, there are still things I’m supposed to be doing–most importantly, work on the revisions to my book. However, all I really want to do is wander around the apartment whistling (it is particularly fun to whistle in the bathroom, because it is so echo-y). I’ve taken to using the whistles as a reward; every time I meet a goal, I get to do a run-through of all the songs I know, and then it’s back to work again. As you might imagine, I set myself lots of goals. I also have some goals associated with the whistle. First of all, I want to eventually purchase a low D whistle (an octave down from the soprano D whistles I currently play) so that I can play the solo from Bryan Adams’ “I’m Ready.” It’s a song I’ve loved since I first heard it on MTV Unplugged–way back when MTV still played music–and I have always been particularly captivated by the whistle portion of the track. (No wonder; it’s played by Davy Spillane, who is practically a god of Irish music.) Secondly, I would like to pluck up enough courage to actually go play with people. I’ve already had an (unsolicited) invitation from a friend to go join in with his band, so it could really happen. I’ve always been shy about performing in public, plus I’ve never been good at improvising and just going wherever the music leads. Many whistle songs–perhaps even the majority–are meant to be played with a variety of instruments, for a crowd of dancers; I feel compelled to at least give this a try. Bernard Overton, the “Father of the Low Whistle.” As you can see, the low whistle is considerably larger than the soprano, and therefore requires more air. I will need to work on my lung capacity before attempting to make music with one of these! Image courtesy of Piper’s Grip. My only fear is that life will conspire to make this difficult. I never seem to have enough time to do all the things I want to do–the story of an adult’s schedule. Even when time is not an issue, there are so many hobbies I start and then have to give up or cut down on for some reason or another (bowling, kayaking, swimming, soccer, guitar, singing…). There is some hope, though. Since getting back into photography a few years ago, I’ve been very consistent about taking pics and trying new techniques; I also continue to creep along with my crochet projects, and I manage to keep my blogs updated in some way or another even when I am swamped with work. It’s all about finding ways to stay motivated, and choosing not to do the irrelevant stuff (*ahem* Facebook *ahem*) when you could be spending your time on more creative and rewarding things. In the hopes that I will, in fact, continue to love and play the whistle as much as I do now, I have recorded myself performing all the songs I’ve learned to date. Hopefully I can periodically repeat the exercise in the future and see (or, more accurately, hear) evidence of improvement. That’s the goal, anyway, and now that I’ve stated it in public, it will be embarrassing if I don’t follow through!